In addition to commercial farmers, many individual gardeners enjoy growing their own wheat for baking or for use in feeding livestock. This common grain crop grows well in most areas of the United States, preferring mild to moderate climates. Like all plants, wheat goes through a series of stages to reach maturity. Good preparation and ongoing care will ensure that your small wheat crop thrives and produces a plentiful harvest of fresh grain. A soil test will alert you to any potential soil problems or nutritional deficiencies. Loosen the top 5 to 6 inches of soil with a sturdy hoe and smooth with a rake. Incorporate any recommended soil amendments over the top of the planting site and mix into your loosened soil. Plant your wheat in the fall, about six to eight weeks prior to the first frost in your area. Use the corner of your hoe to dig long furrows in your planting site. Make your furrows about 2 inches deep and approximately 12 inches apart. Drop your grain seeds into the bottoms of your furrows, leaving about half an inch of space between each piece of grain. Cover with about 2 inches of soil to form an even surface. Pat down the soil over the tops of your covered seeds. Moisten the soil with a spray of water. Water until the top 2 inches of soil becomes evenly damp. This will help your wheat to begin germinating. Although wheat seldom requires supplemental watering, a light application of water during dry spells will increase the growth of your grain seeds. Stop watering when the ground begins to freeze. Pull weeds or hoe the area between your rows of wheat if you notice weeds emerging. Avoid disturbing the roots or stalks of your wheat grass. You may also place a strip of landscaping fabric between each row to reduce the growth of weeds. Wheat planted in the fall, known as winter wheat, matures during the late spring or early summer, depending on your climate. Check for ripeness by plucking a few heads of wheat when it turns a golden-yellow color and begins to bend toward the earth. Remove the outer casing from the grains of wheat and pop them in your mouth. Wheat that feels firm and crunchy is ready to harvest. Snip the heads of your mature wheat into a basket, using a pair of sharp utility scissors. Separate the grain from the chaff by pouring small amounts from one container to another, going back and forth until the particles separate. 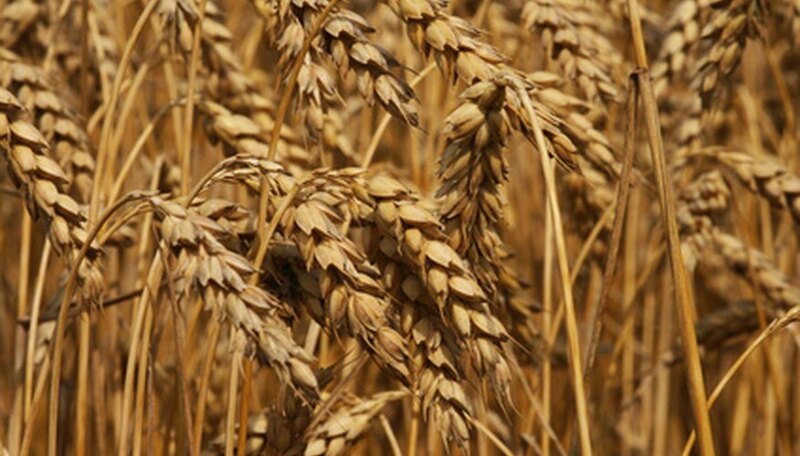 Store your cleaned wheat in a freezer to avoid bugs, rodents and mildew. Use a coffee grinder to grind small amounts of wheat into flour.